St. Laurence, at the western edge of South Shore, has stood as a landmark in the community since 1911. 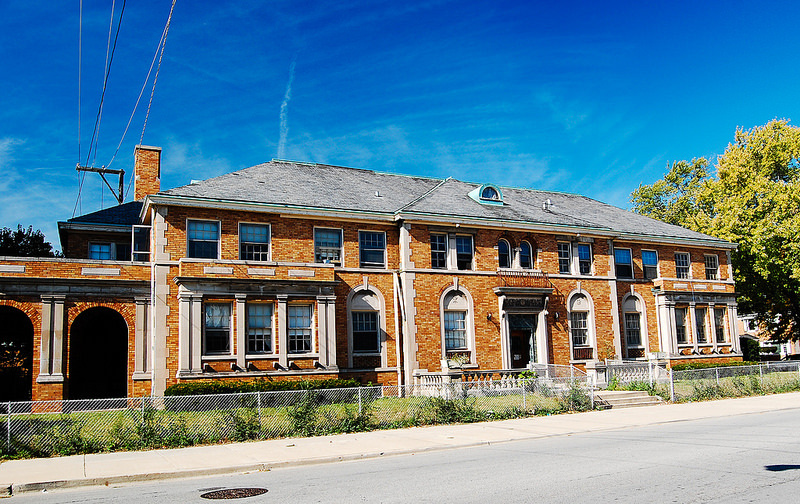 When it was built, more than a decade before the real estate boom that saw South Shore become a truly urban neighborhood, it served the small railroad suburb known as Parkside. The church is an imposing edifice, towering over its surroundings. Warm orange brick is laid in interesting patterns, with copper trim, slate roofing, and stone figures enlivening the design. 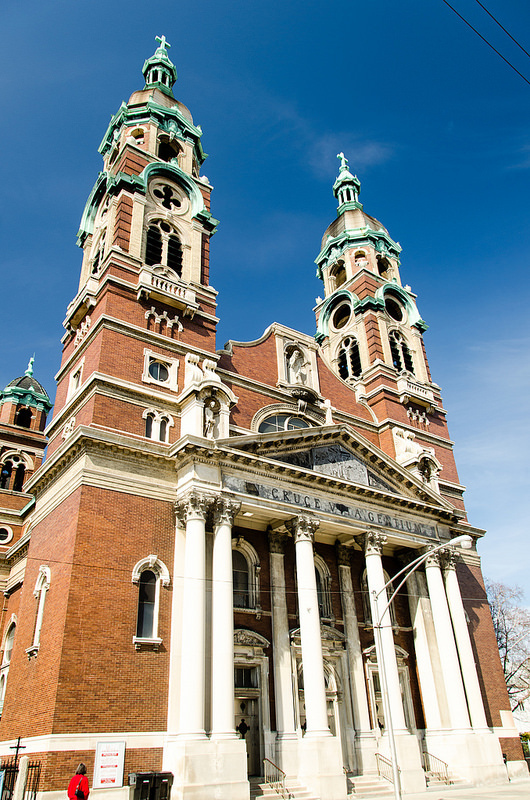 The architect, Joseph Molitor, is known for designing a number of Catholic churches around Chicago. 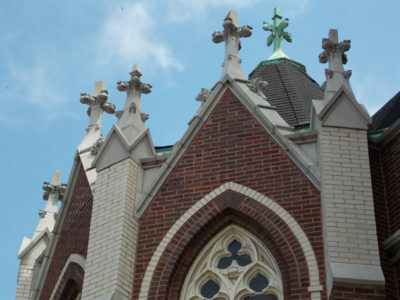 He had a hand in the simpler St. Francis of Assisi on Roosevelt Road, as well as the much more ornate Holy Cross, a Lithuanian parish on 46th Street in Back of the Yards. The rectory, also by Joseph Molitor, was a match in materials and style to the church. It burned several years ago, and I am astonished that its remains were left standing until now. 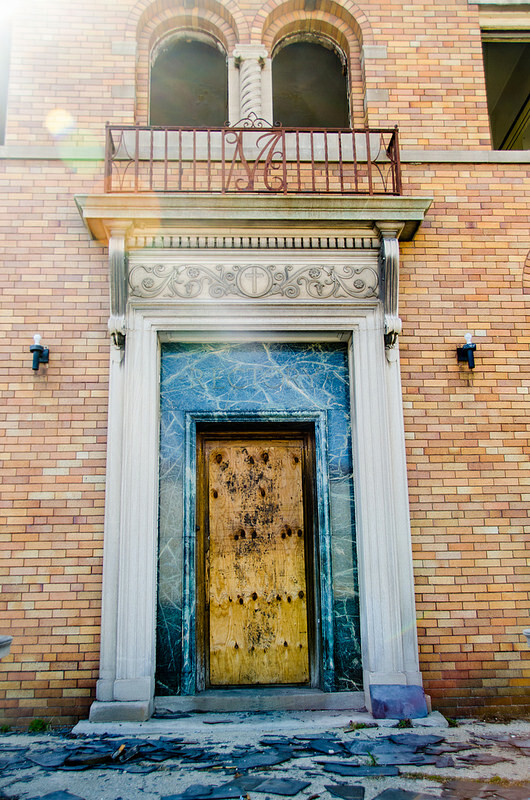 The parish hall, designed by George Smith in the 1920s, is a more modern-looking building, low slung, with more elaborate and expensive Mediterranean Revival details, and marble around the front door. The school building, about which I know little, takes its design cues from the Art Deco and Prairie School styles, with very strong verticality and spare ornamentation. 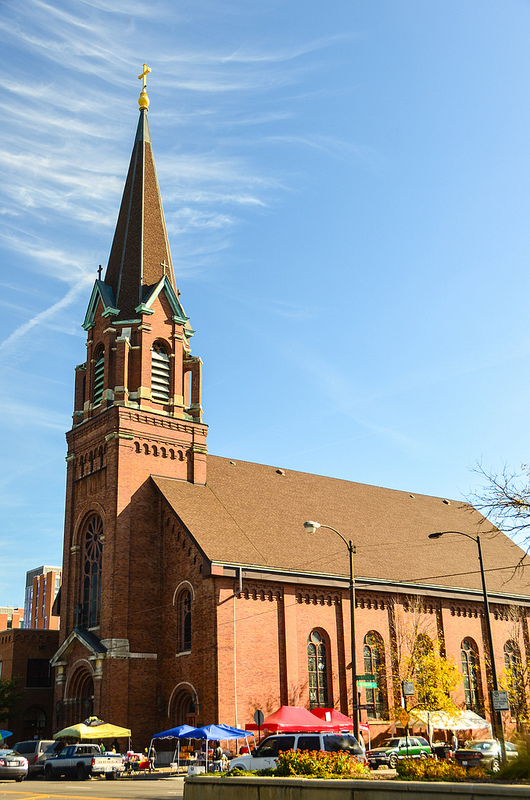 The entire complex was closed by the Archdiocese of Chicago in 2002 – by which time it had very few members in this no longer particularly Catholic neighborhood, and was in need of at least $3 million in work. It was purchased in 2005 by Eden Supportive Living, a company that develops and manages supportive living communities for those with physical disabilities. It appears that they planned to tear down the buildings from the outset – which makes no sense, given the available inventory of vacant land quite nearby. 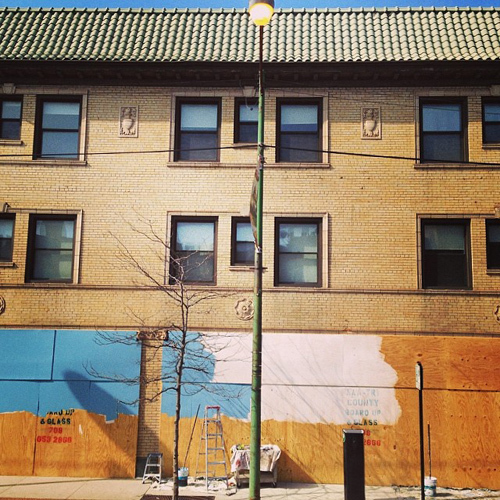 Their website still lists a South Shore community anticipated to open in 2014. 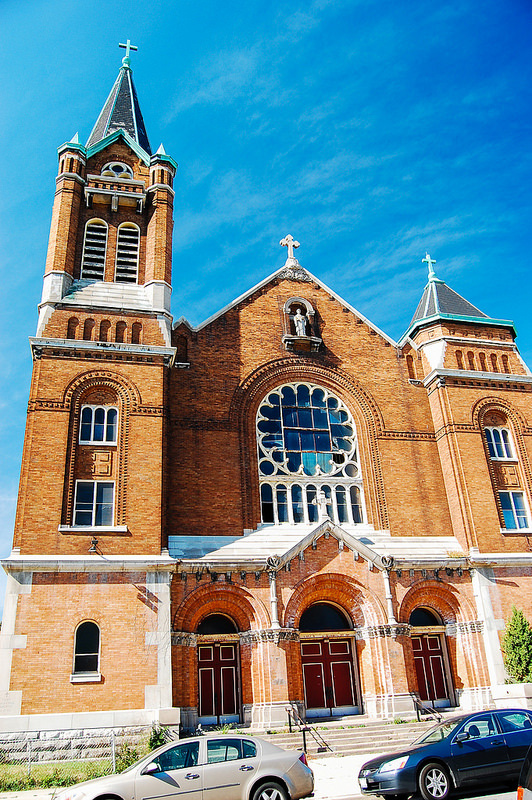 Because of its distinguished architecture and history, St. Laurence was rated Orange by the Chicago Historic Resources Survey. 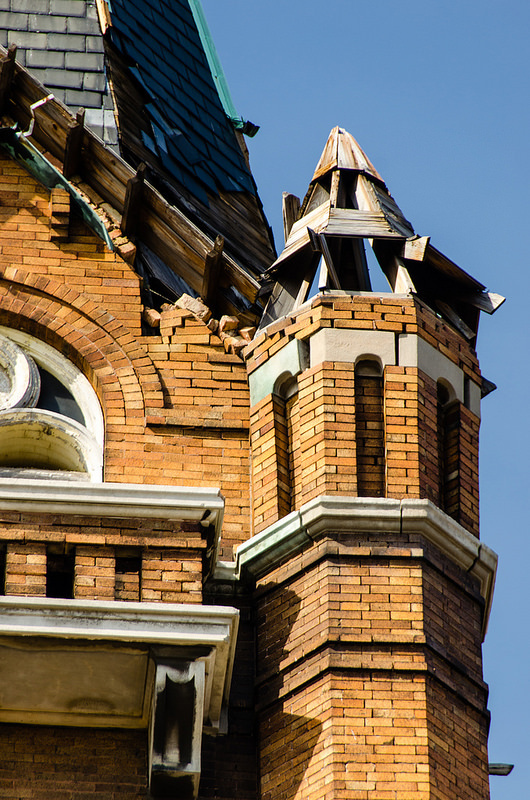 This mandated a 90-day demolition delay, an opportunity to identify possible reuses or ways to preserve the buildings. Perhaps sensing that there might be significant opposition to their plans, or perhaps just because of the recession, Eden Supportive Living waited out the clock – and then some. Under Eden’s neglectful watch, virtually no maintenance was performed, and efforts to secure the premises were desultory at best. The rectory fire, in 2010, was started by an open flame – likely by vagrants burning trash for warmth or doing drugs. Eden has been difficult to reach and has resisted reasonable offers of purchase from parties interested in preserving some or all of the buildings. 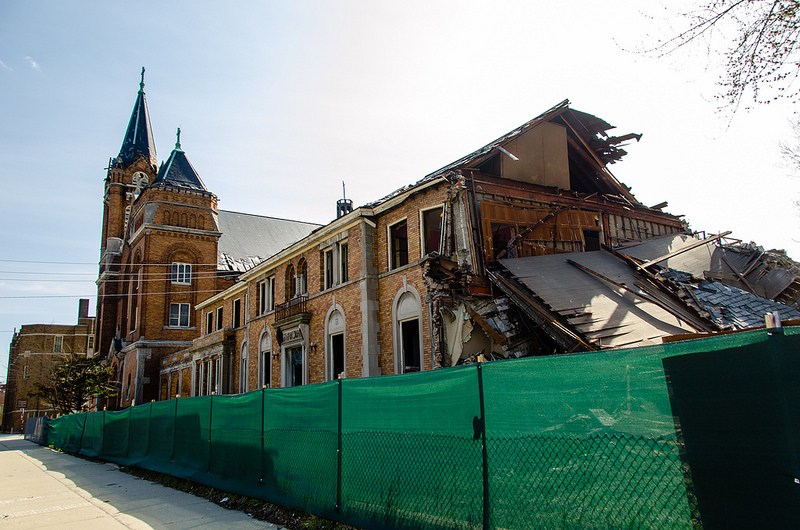 Having allowed St. Laurence to crumble for 9 years, they have now begun to demolish it. They surely hope to escape any blame for doing this – though it was their plan all along – by arguing that it is now unsafe and must be demolished. This may be true on its face, but of course the unsafe conditions were caused entirely by Eden’s neglect. 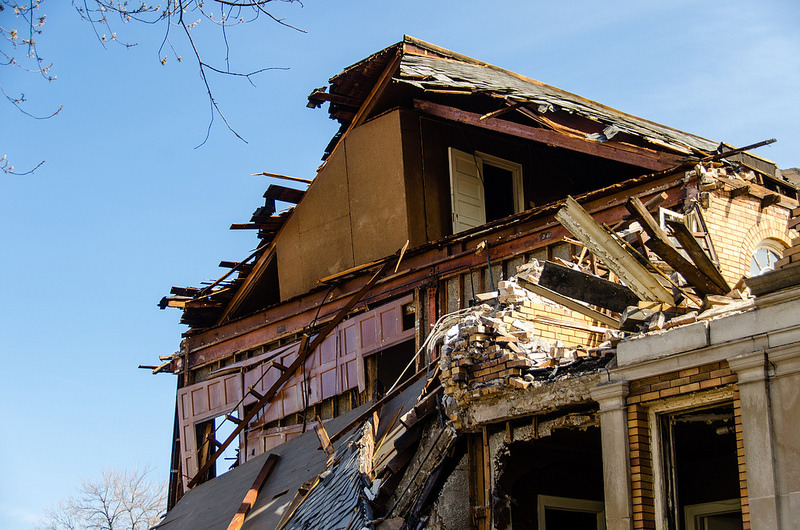 The Demolition Delay Ordinance can’t save a building if an owner is determined to let it fall down. 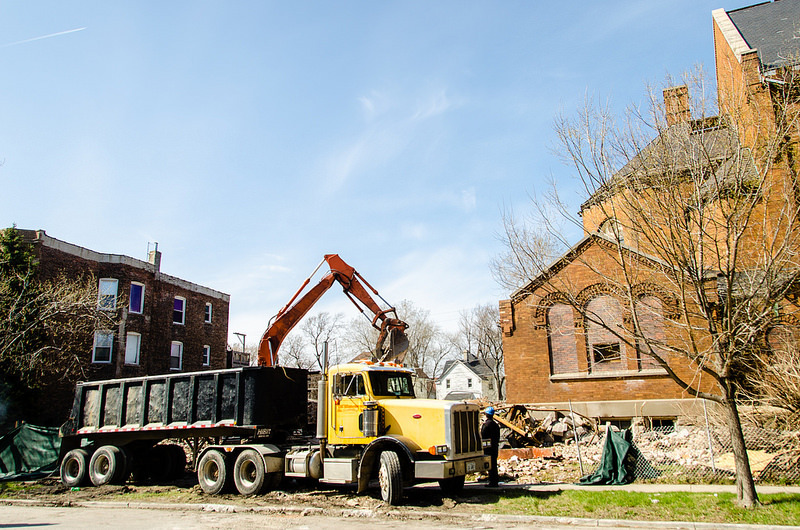 The rectory has already been demolished, and its rubble was being loaded into a dump truck yesterday. 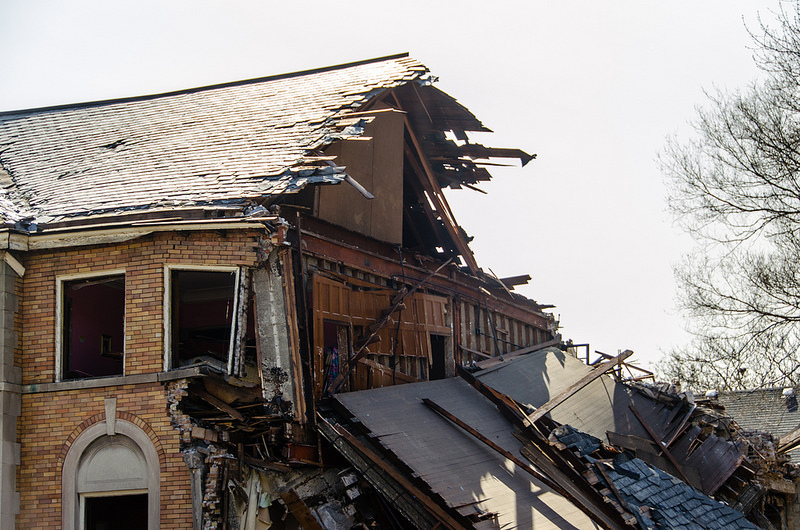 As I write this, demolition is likely almost complete on the parish hall. Fortunately, some material, including beautiful wood paneling, is being salvaged for reuse. The church will be the next to fall, very soon, in what is sure to be quite a spectacle. The school building is not currently the subject of a demolition permit. However, it is not secured, and is being actively looted. It too will almost certainly be demolished. 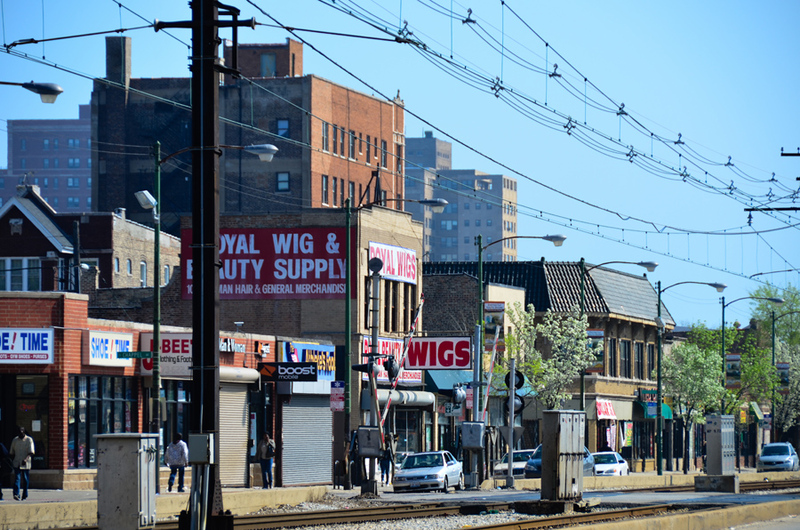 South Shore is a neighborhood facing many challenges. 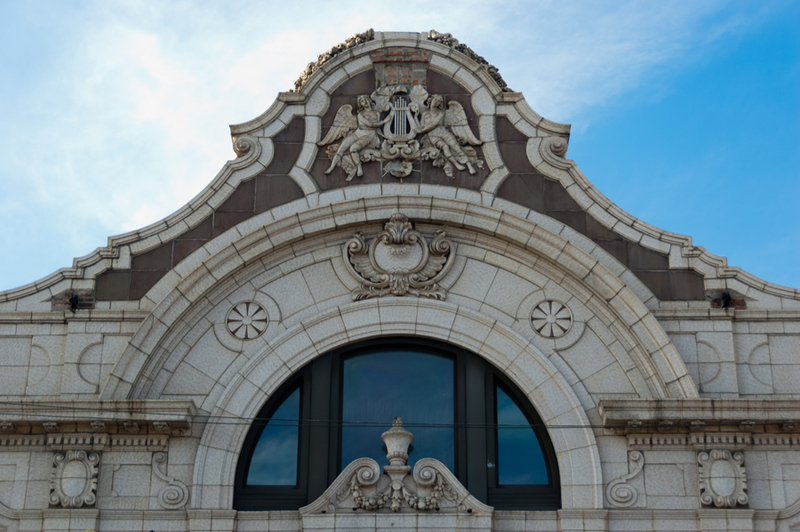 It has many assets – among them gorgeous historic architecture. Eden Supportive Living is committing an act of cultural vandalism here, and it is too late to stop them (though preservationists and community members have been trying for years). In failing to hold Eden accountable to any standards whatsoever, the neighborhood’s political leadership has once again shown its uselessness. Just a few short blocks to the east, a similar fight may soon unfold. 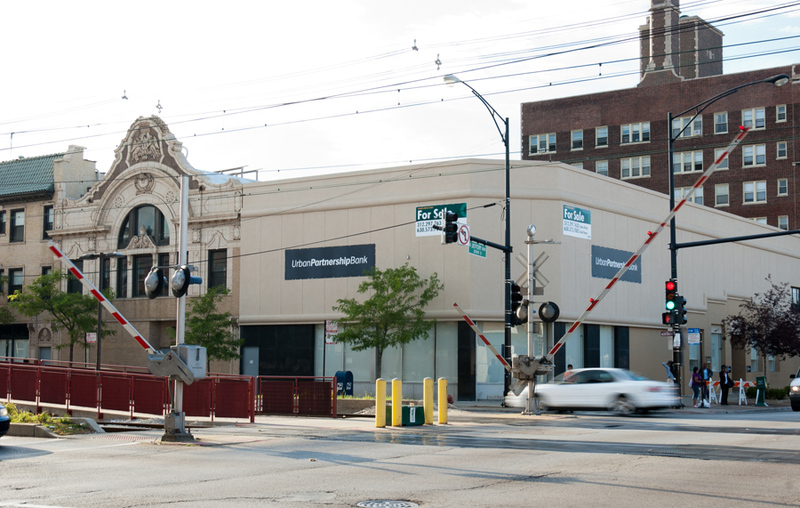 The orange-rated Jeffery Theater and attached buildings – long the home of ShoreBank, the institutional anchor of South Shore – is now vacant. Urban Partnership Bank, which claims to carry on ShoreBank’s mission, is but a pale shadow of what ShoreBank once was. The only potential buyer recruited for the property wants to demolish the buildings and construct a strip mall – which would be located next to a commuter rail station, and kitty corner across the intersection from an existing strip mall, which is itself missing an anchor grocery store thanks to Dominick’s departure. The building has been boarded up – which is not conducive to selling. Adding insult to injury, Urban Partnership recruited a Bridgeport-based artist to paint the boards, making no effort to involve neighborhood residents. The bank has not allowed outside parties to view the building in order to assess its condition and market it to more sympathetic buyers. 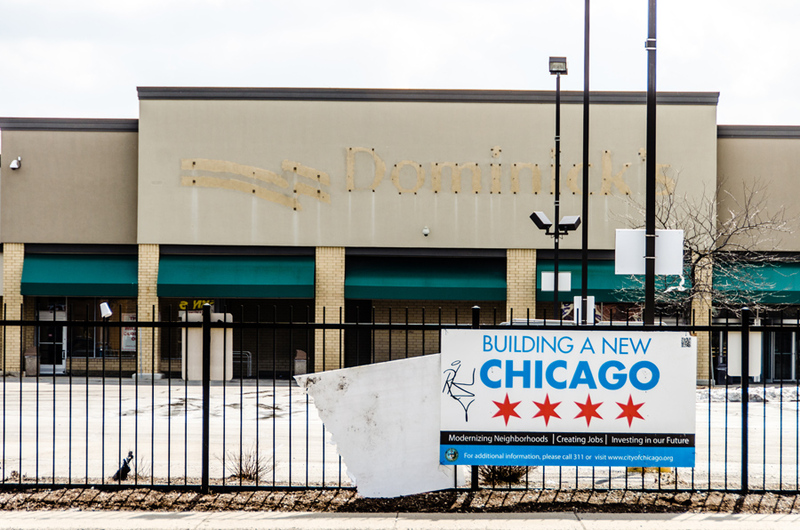 Urban Partnership is seeking to cash out quickly, and doesn’t care if that means saddling the neighborhood with another eyesore of a failed strip mall. But it’s not too late to fight this. 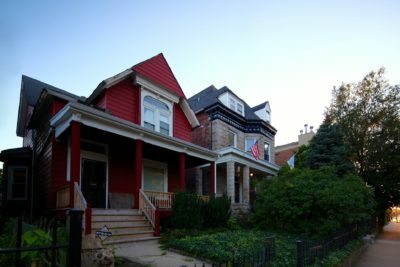 Please consider coming on a walking tour of 71st Street, showcasing its architecture and history, this coming Saturday, April 26. 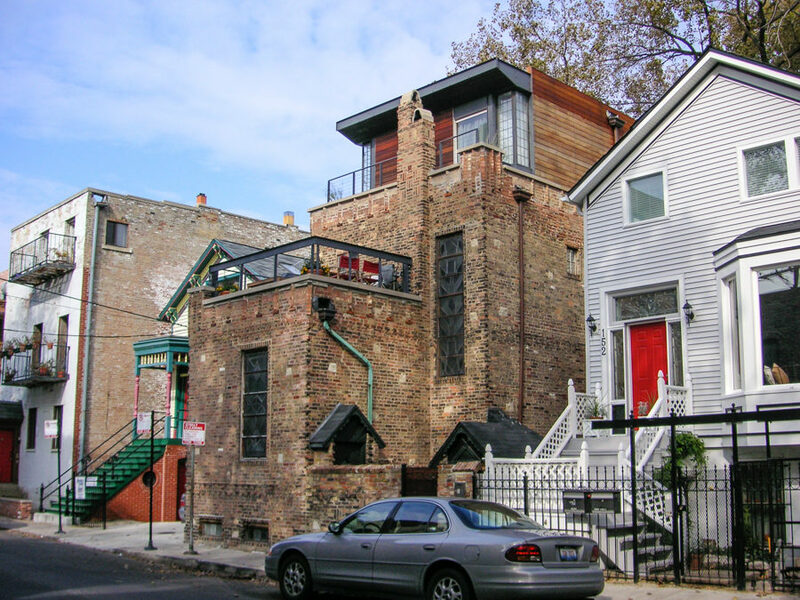 And please sign the online petition calling for the creation of a Chicago Landmark District along 71st. 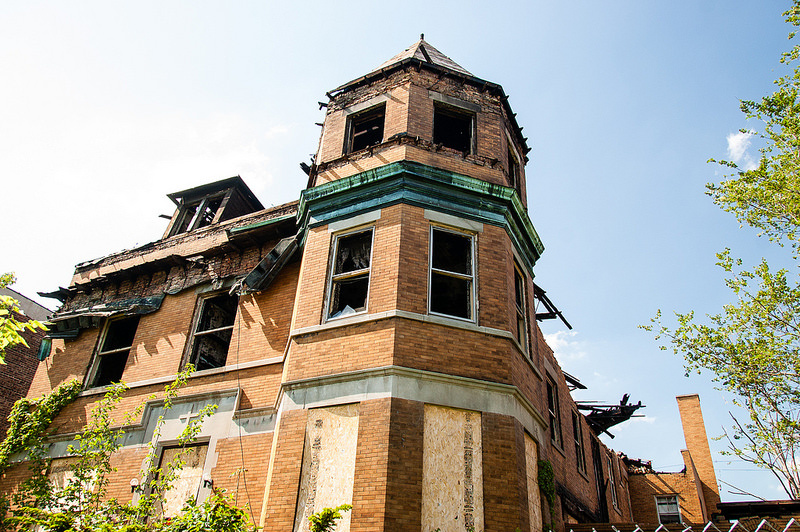 A Landmark District provides much stronger protection against demolition, as well as incentives to owners to preserve and rehabilitate the buildings that give 71st Street and South Shore a distinctive sense of place. Don’t stand by and let Urban Partnership Bank sink to the level of Eden Supportive Living. 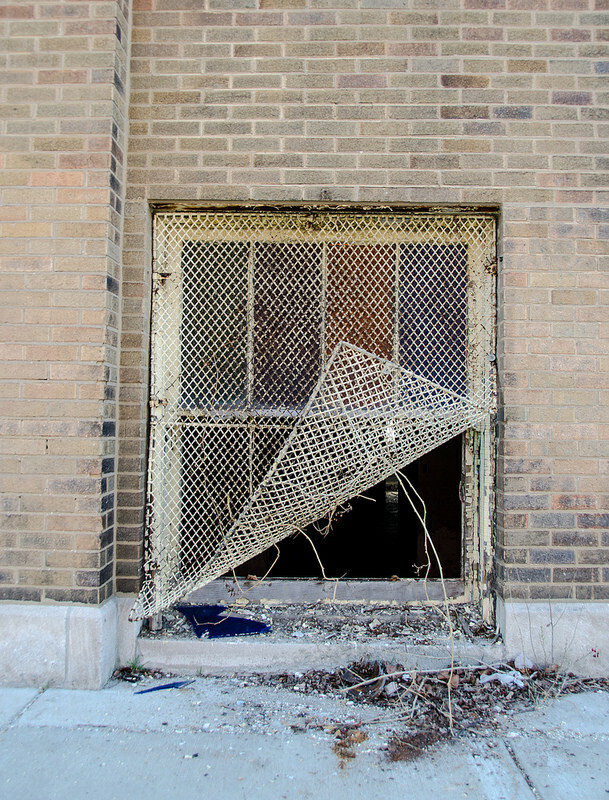 With your help, we can avoid a repeat of what’s happening at St. Laurence. 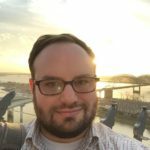 This article originally appeared on Eric Allix Rogers’ web site, reallyboring.net. I personally think that church is pretty ugly, but that’s just my opinion. Additionally, what are your credentials to accuse this company of being so negligent with the maintenance? If you are not a professional, you should choose your words more carefully. Seriously? I need special expertise to claim that a building that has a court order for demolition, subsequent to years without maintenance, was neglected? The tone you used seemed to imply that the entity that purchased the property was responsible for letting it deteriorate to a point where it made sense to tear it down. It sounds like the property was already in poor shape, and $3 million is a lot of money. I love old architecture, but I also don’t believe laying blame where it doesn’t belong. Apparently the building sat vacant between 2002-2005? Was there maintenance being done during that time period? If you buy a property knowing that it needs $3 million in repairs (assuming that is not an inflated price, since it is known that certain entities, such as the Archdiocese will inflate the cost of repairs to a building to make their case for closing a property seem stronger), then you either should have $3 million on hand to repair the property, or enough to shore it up to keep the city satisfied. 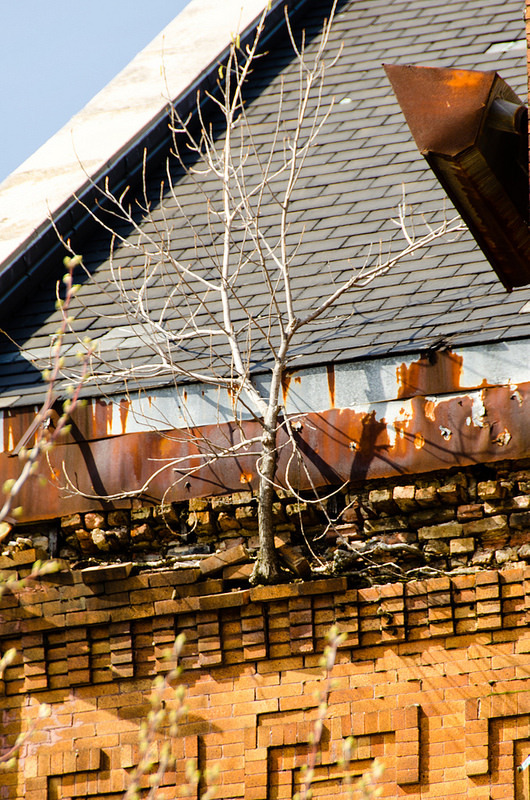 Instead, what many developers will do is tell a community that they are interested in preservation, just so that they do not meet resistance when purchasing a property, then purposely let the building decay by not taking simple steps to keep it from deteriorating further. In fact, I’ve seen them break out/open windows in buildings just to get water into the structures, knowing that water inside of an empty structure will cause deterioration to accelerate. Then the city does their dirty work by issuing a condemnation of the structure, allowing them to tear the property down, and do what they REALLY want with it. I do not know the details on this property, but if you are not familiar with developers and how they handle preservationists, I encourage you to read up on the old Ambassador Hotel in Los Angeles, and see how that whole thing turned out. Developers, whether they be public or private, know how to get around preservationists, and still save face to the naive. Is “Clark” serious? Have you even walked passed the church after if was purchased? There was little done to secure the property and they left it to rot. The maintenance that needed to be done on the property before closure consisted of updating electrical, plumbing, heating, etc. It was structurally sound. Anyway, great piece Eric! Just another sad chapter in Chicago’s history. it’s always sad to hear about a gorgeous historical building going down. 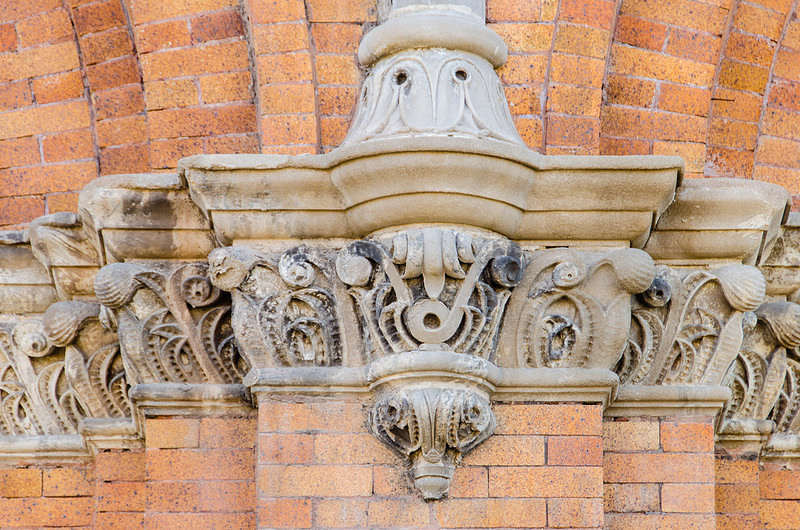 there are so many great stories of the city always trying to salvage these works of art. will they be at least salvaging pieces of the structure inside & out? i would love to get a pew for the rehabbed church that i am currently living in. thanks! Hi Maria, sorry for my slow reply! The pews had been destroyed by the time I ever saw inside. They were just smashed up, unfortunately. I do know that, against the wishes of the owner, a fair amount of the brick and other material was salvaged and will be reused (the cut-rate demo people who did the work were fairly easy to, uh, convince to sell the materials instead of throwing it away). Why yes “Paul” (if that’s your real name) I have walked by it, I am serious, and thanks for your knowledge. Do you know what maintenance was done between 2002-2005? “Electrical, plumbing, heating, etc.” sounds like a lot of work, although if we all pitched in and kept one of those Home Depot buckets emblazoned with “Let’s Do This” nearby for inspiration, I bet we could bust it out in a day or two. I went to St. Laurence in the early 50s. My father and cousins graduated from there. I lived at 69th Pl. And Harper. I remember walking to school and crossing the retractable ks as a second grader alone! St Laurence was a beautiful church. I made my First Communion there and loved being in the variety shows the school would have. It is so very sad to see what has become of my childhood neigjborhood! Thanks for leaving a note, Mary. The school building is fortunately still standing and has been sold, I believe, so I expect it’ll be around for a while (though I do not know what will be done with it). I am hopeful that some of the good things happening right now in this area will take root and make for larger positive change – time will tell. 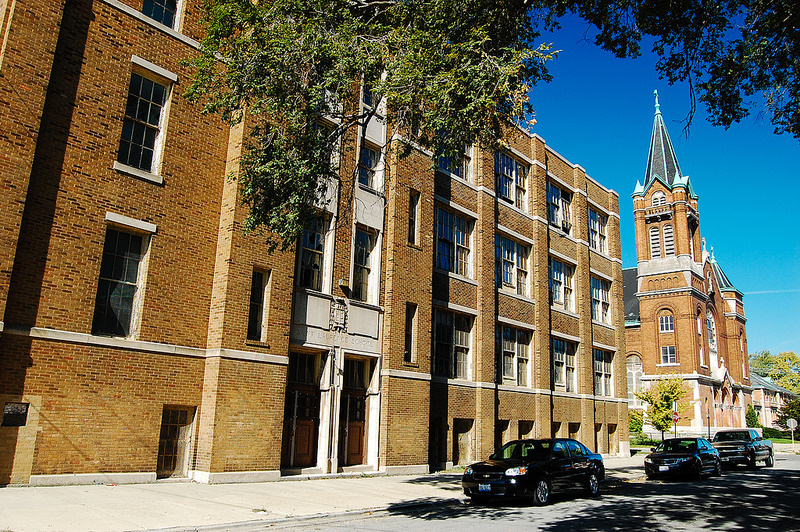 I grew up living on that block and attended St. Laurence grammmer school. I was married in the church in 1975. I would like to correspond with you as I have so much to say in agreement with you. Sorry I am late with this as I just found the website. Hi Colette! Sorry to be so slow in replying, but I would love to hear more about your history with the school and neighborhood. Feel free to email me at ericrogers at gmail dot com. Thanks! I am trying to remember more about my time at St. Laurence in the early 50’s. I seem to remember the picture you have labeled as the rectory being the site of the convent. I remember being inside it. Also what you call the parish hall was the rectory as I remember it. I remember a priest, Fr. McKay, standing on the steps near the sidewalk as school let out and talking to the students as they walked past him. Anyway that’s my memory of the grounds. The Church was so beautiful! I still have my group First Communion picture of May 7,1953. Mary is correct. The convent was the large building on 72nd street and the rectory was around the corner on Dorchester, both were connected to the church. That was one of the most beautiful churches I’ve ever been inside, I too made my first communion there and came back to be married there in 1975. Why won’t Rome with all of its riches support local parishes to insure the future of growing young catholic? I’ve always felt the system just does not care if the neighborhood is not the right one. Eric, I enjoyed your piece on St. Laurence including the pictures. My grandparents married there in 1912.I went to school at St. Laurence in 1946-1948. To a 6 year old the classrooms looked really old.High ceilings and lots of wood and walls of blackboards.The school had an annual musical held in the auditorium. It was my family’s church until the 1960’s. The stained glass windows were exquisite. Donors in the parish paid for them. They now are part of St. Stephen’s in Tinley Park. Conveniently Drumm funeral home was just across the street and many of the parish were waked there.Many of the parishoners lived in the many apartments around St. Laurence. Unlike today their residence was not temporary they lived in the apartments for their lifetime.Thus parishoners for a lifetime. I was the pastor at St. Laurence Church from 1992 until its closure, June 30, 2002. The building shown as the rectory was indeed built as the rectory. I believe during the 1930s, the Archdiocese of Chicago bought the alley just north of the church and the land north of it. There they built the new rectory and converted the rectory into a convent. They subdivided the priests’ suites and added rooms on the north end of the 2nd floor to accommodate the additional residents. Some time between the mid 60s and the mid 70s, the rectory was given to the Religious Sisters, the priests moved into the 1st floor of the school, and the prior convent was used for other purposes. In response to Colette Quinones’ remark about Rome (the Vatican) helping keep the parish open, that is not realistic. There are over 1 billion Catholics world wide. Many do not obey the Church’s Teaching to attend Mass on Sunday, and these most likely do not share any of their time, talents or treasure with the parish. Thus the parish is not able to sustain itself. Given Chicago’s history of re-segregation, the familiar cycle was that as descendents of Africa moved into the Greater Grand Crossing and South Shore area, most of them Protestants, descendents of Europe, many of them Catholic, moved elsewhere, including the suburbs. The area may have been 70% Catholic in the early 1950s, and less than 10% Catholic by the mid 1970s. It hurt me personally, and the parishioners there until the end when we closed. However, St. Philip Neri Church is less than 1 mile away. In the suburbs, in many instances the nearest Catholic Parish is over 3 miles. God bless those who read this, and your practicing your faith can help keep your houses of worship open. In responce to Fr. O’Reilly. As a “decendant”of Africa, I have to tell you that I too live in the suburbs and have for the last 25 years. When my family and I were involved In St. Laurence, the Pastor was Fr. Foley. Even at that time( early1960’s), there were irregular things going on in the rectory but least Fr. Foley was indulging with an adult female. To say anything more would be like “beating a dead horse” especially in the great scheme of what was to be disclosed in future times. Consequently my family pulled us out of the Catholic system and we joined St. Paul Lutheran church which was in the same neighborhood. Maybe in light of the things that have transpired in the true history of the Roman church and what is going in right now, the wisdom of God is working the way the bible prophesied. My grandparents, Mary and John Costello, raised 7 children on E 72nd Place – around the corner from St Laurence. My aunts and uncles were married in this church and many of our family baptisms were held at St. Laurence. It is an ancient story of immigration, poverty, sending the kids to school, the 2nd generation doing much better and their children becoming affluent and moving to the suburbs. Though it is very sad and is causing me to feel very tearful, I realize that my affluence is a direct result of the lives that were allowed to prosper in this parish. The nuns and priests gave their lives, and the hardworking people who gave up much to make the lives of their descendants financially more secure. We have lost so much by losing these wonderful old neighborhoods. I went to school there for 7th and 8th. grade and graduated in 1954. I loved the Church, especially the mural of St. Joseph on his deathbed with Jesus and Mary at his side. No wonder he’s the patron Saint of a peaceful death. I just hated to see the picture of the Rectory being demolished. Do not want to see one of the Church going down. What a shame that it couldn’t be saved. Thanks Father for the history you gave us of the rectory and convent. My Father, cousin and I all attended St. Laurence. I remember attending the children’s Mass on Sunday in our uniforms and red beanies. The shows every year were almost the highlight of my school yr. I remember being in The Wedding of the Painted Doll and also another when singing Down in Ole Kentucky Where Horseshoes are Lucky! Also I was terrified to go up to the office of Sister Hilda Marie when I was in second grade and doing an errand for Sister Fides or Sister Helen John. I also remember taking dancing lessons at the Greene Sisters School of Dance and it wasn’t too far from the school. The only reason we moved in Oct. 53 was that my Father who worked for the government was transferred to Olkahoma City. What a difference when attending the Catholic school there. They were so far behind and talked so slowly. I only have good memories of ST. Laurence and by the way Father, I was baptized at St. Philip Neri as my parents lived on Olgesby when they first married. I also loved the Adrian Dominican Nuns . They taught us very well. I had them at St. Carthage before I moved to 71st and Drexel. We had a long walk back and forth during our one hour lunchtime but it was always enjoyable visiting with the others who walked our way. Just wondering if you knew my cousin, Rosemary Easterhouse? She graduated and went to work at Southshore Bank. I think I remember the name right. I remember being so afraid of Sister Hilda Marie. No reason, just thought her dim office was scary when I was very young. I also had Sister Fides (1 & 2) and sister Helen John (3). We moved during my 3rd grade. some great information on the church ,I to went there back in the 50 s and I also got married there. Please keep me up dated. That’s a bummer, I went to the school back in the 60’s, but everything changes with time. Too bad. I attended the school from 1956-1959. What lovely memories I have and very few class pictures. It’s very sad no one cared. I lived directly next door to the Covent. As a little girl, I and my siblings would visit the church. The Priest and Nuns were extremely nice and friendly and always willing to teach us about God. They would even give us tours. The Covent was a beautiful building. I was a young girl but I still can remember some things. I can even vaguely remember when the convent was overtaken by gang members fighting for civil rights. I’m saddened by the loss of this historical building. I went to St. Laurence from 1948 to 1956. All of my class pictures were lost while I was in the army. Can anybody help? I’ll ask my niece if she has any of her Mom’s photos. Julie Cjhouinard was my sister and graduated in 1956 I believe. Melanie. Did you ever find any pictures related to the Class of 1956? I am having no luck at all. Thanks. I went to St. Laurance from 1942 to June 1950. Had a great time and made friends I keep in touch with today. Was in many weddings at that beautiful church. Hate to see it go. In reply to Linda Lake, I lived on the same block as the convent about 6 doors down and when the gang members occupied the old convent it was because the archdiocese of the catholic church wanted to put a half-way house there for men who were just released from prison. My father was the pricinct captian and had to use whatever resourses to fight that and make the church respect the saftey of our young children who were still running free and playing. At that time the gang members were pretty much under control because the people of those three blocks got together and talked to those kids and fed and mentored them. Walter Jacobson from CBS covered the story and the whole block was on the news. I wonder if Ms.Lake is realted to my old girl scout leader Mrs. Lake who lived on east 71 Place. I really enjoyed growing up there and attending St.Laurence grammer school and was married in the church in 1975. If Mrs. Lake is your mom, please respond to me. BTY My maiden name is Desamangles. I also remember going into the basement hall and kneeling down covering our heads during the air raid drills. I attended from 50-53. I went to Parkside for Kindergarten. OLD memories being stirred up here, graduated St. Laurence in 1960. Also went to Parkside K through 3rd grade. My two brothers and I used to sell the newspapers in front of the church on Sundays. Hey Carl don’t forget me, your little sister. I went to St. Laurence first thru eighth grades. I graduated in 1963. We just visited the Vietnam War Memorial in DC and I found 3 of my classmates names on the Wall. So sad! It’s also so sad to see these beautiful buildings being torn down. Many, many wonderful memories of going to school there, attending Mass, First Communion, Confirmation, the St. Patrick’s Day School Plays, the Dominican Sisters, and the wonderful friends we made there. I attended St. Laurence from 1946 to 1954 graduated and went on to Aquinas High School. The education and the teachings from the schools have carried me through my life. To bad there are not more Sister Hilda Maries…maybe our world would be in a better shape if she was still around. 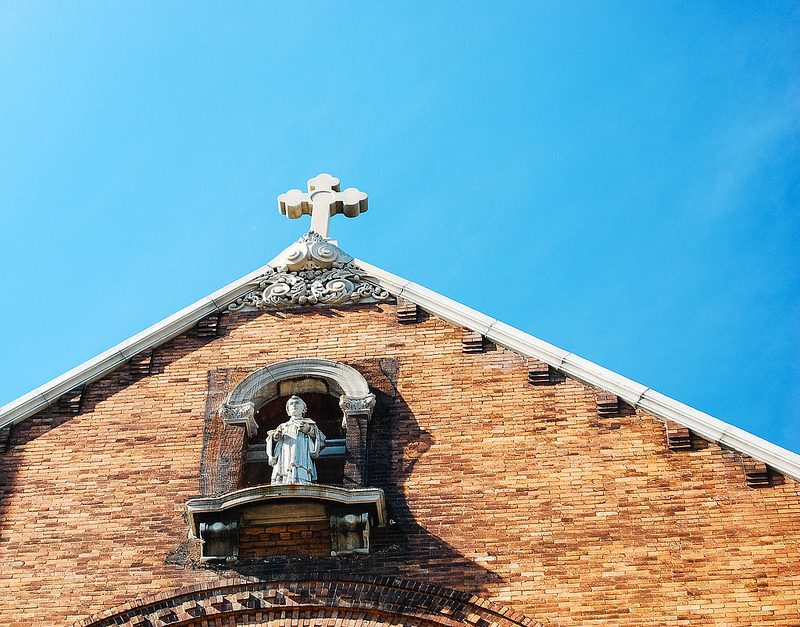 The beautiful buildings of our parish will stay alive in the memories of all who entered their doors. It is such a shame to see these beautiful building being destroyed. I personally have such great memories of this time in my life. All the priests and nuns where household names. I too remember Miss Green the dancing teacher, and how every year she put on a great St.Patricks day play. Something different for each class 1 thru 8. It seemed t0 me that most everyone knew everyone else. A great time to be alive. So sorry to see it go. I attended SLS from 1951 – 1959. My next door neighbor, Ray Bruchs, was a Navy Fighter Pilot. Upon his return from Korea, he buzzed the neighborhood for about 5 minutes before landing at Great Lakes. Ray’s family and neighbors were outside waving to him. Sr. Hilda Marie announced on the PA that there seemed to be an airplane experiencing engine trouble in the area so dismissal was delayed until 3:15 when the “danger” had passed. My Grandparents the Riordan were one of the founders of St. Laurence. My father went there (did not graduate from there). Me and my sister went there and I married my husband with Father Tuit officiating. Remember the St. Pat’s recitals, Mrs. Green, Many of the Sisters of course Sr. Hilda Marie, I swear i could smell her going down the halls! And Sr. Patrick Eileen and Phelan! Yes, Rose, the scent of her Chanel #5 preceded Sr. Hilda Marie by a good 5 seconds. There is a reunion every year the in July. For all who attended Madison, St Paul, St Laurence and anyone else. The reunion is in Crestwood IL always on a Saturday from noon to 6pm with buffet lunch the cost is $25.00 per person. This year the reunion is July 23. Mike O’Brian is in charge. Location Crestwood Civic Center , 14025 South Kostner Crestwood IL. For your comfort, Civic Center is Air conditioned. The menu: Chicken, Roast Beef, Italian Sausage, Rolls, Salad, Beer, Wine, Pop and Water. You can contact Mike at 708-371-3224 for details. Is this reunion really open to all who attended no matter what years they were there? If so, this sounds wonderful because I went to St. Laurence and St. Paul (the one on 76th and Dorchester?) Please respond because I have kept in touch with a lot of my grammer school classmates and this would be so neat to be a part of this reunion! This is the most unorganized reunion I have ever been to. Colette, people who attend is from around 1950 to 1958. Contact Mike O’Brian to get all details. 708-371-3224. Every Year new people attend and others can’t. We try to bring old friends together. Yes all are invited. Thank you all for sharing these memories with us, and with each other! By way of a brief update, unfortunately, not much has changed since the church, rectory, and convent were wrecked. The site remains vacant, despite the owner’s insistence that a construction project was going to begin imminently. The school is secured under new ownership, but I am not aware that anything has been done with it at this point. Just drove by the area on trip from Texas. Trying to get pictures for my elderly mom who can not make it up to Chicago. Took great pic of her childhood home and St Lawrence school. Someone is building something across the street from the school. No idea what though. My mom’s maiden name is Brennan she lived at 1499 72nd street. How Sad…I went to St. Philip Neri and Aquinas High. I drove by there a couple of years ago and took pictures. What a beautiful set of buildings. Seems to be that politicians should have invested and provided a full service community area for education, training classes and more to help the communities and get the children into a better environment away from gangs. My uncle, Monsignor William Kinsella, built St. Philip Neri Church and the School. It is my understanding that many of the materials for that beautiful church were brought from Italy. All of my aunts went to Aquinas and were among the first students to attend when it was first built. He was the first pastor and his name is inscribed on the front of the church. My grandmother, Mary Kinsella Costello was his sister. They were originally from 42nd and Lowe. Hi to my former classmates of 1950 Larry Marshall & Jack Aichele. I was so saddened to see the church coming down and the rectory already gone when my son quite unexpectedly drove me there during the process.The church, rectory & convent were such beautiful buildings reminiscent of the times in which they were built. I have such fond memories of my 8 years there, and still keep in touch with some of my former classmates. We go back a very long time to a much simpler life. I can still remember all the preparations for 1st communion, the alcoves of the saints surrounded with blue lights on all Saint’s Day, the St Patrick’s Day plays and many other happenings. We all received a wonderful education from the Adrian Dominican sisters. Here’s to those fond memories. They cannot be taken away!! Finding this web site brought back old memories. I graduated in 1949 andI remember the St Patrick day plays, being in the band, serving mass as an altar boy, classmates like Pete Donovan and Owen McAteer. The Sisters Rose William, Ester and Hilda Marie. Just turned 81 – time does fly. Kelly, your Mother, maiden name Brennan, what is her first name and what year did she graduate? I graduated in 1954 and Sandy Brennan was one of my friends, also Marilyn Reynolds.Carroll Mayer Bourrillon. Please reply. Thanks! Hi to Larry,Jack,Marge and Dolores. My favorite memory is being allowed to attend Midnight Mass on Christmas Eve and the excitement of seeing my friends and classmates afterwards. I also want to thank my classmates for their friendliness as we moved to Chicago from South Dakota after the war. It did’ take long to feel at home. Hi to all. I found an old file and found our graduation picture 1950, 4th thru 8th grade class pictures., also 3 St. Patrick’s Day play and a group shot of the alter boy’s and choir boys. I don’t remember a choir. Lots of memories. I could sing HARRIGAN and “flap toe step”.Sheila I remember your dad, he and my dad were good friends, we were all in the 134 IBEW. I hope your doing well and healthy. We lived across the alley from your family. Your dad Art and mom were very good to my family after our dad died in 1955. Your younger siblings Marysie, Tommy and Dickie were all so nice as well. ‘Hope you and they are all well. I remember the first day I attended St. Laurence as a very scared first grader. It was 1944 and the war was on and it seemed an especially dark time for me with my uncle in the Pacific and everyone’s focus on the war. I remember lining up on 72nd street and marching into the school in a pouring down rain storm. Seventy-two years is a long time by anyone’s measure but it is funny how you do remember things and places that had an impression on you so many years ago. I now live in California a million miles in time and space from my time growing up on the south side of Chicago. I went to St. Laurence from 1955 to 1968. All but one of my brothers and sisters graduated from there. Such wonderful memories. I remember going down the fire escape during fire drill and all of the St. Patrick’s plays, “For you, Monsignor!” What a great place it was. Sheila O’Halloran, did you live on 74tth and Blackstone? Melanie, didn’t you graduate from grammar school in 1963? And yes, I sure do remember those fire escapes!!! I worked in the office and rang the hand bell after lunch break. How about May Crowning and everyone gathering in the auditorium to practice singing the songs? Walking on the sidewalk lines to go over to church, waiting forever to get those 2” white heels for graduation? Getting our “ribbons” to wear all through 8th grade. Wondering if the nuns had hair under those head pieces? The school colors were green and gold. Memories, memories, memories! Attended St Laurence from 1954-1960. My parents moved to Oak Lawn after graduation. I wanted to go to Mt. Carmel H.S., but ended up going and graduating from St. Rita H.S. Some of my St. Laurence classmates – Judy Costello, JoAnn Johnson, Judy Dilger, Judy Holden, Andy Knauf, Ken Packheiser, Jimmy Riordan, Johnny Jarvis, Louie Leon, etc. 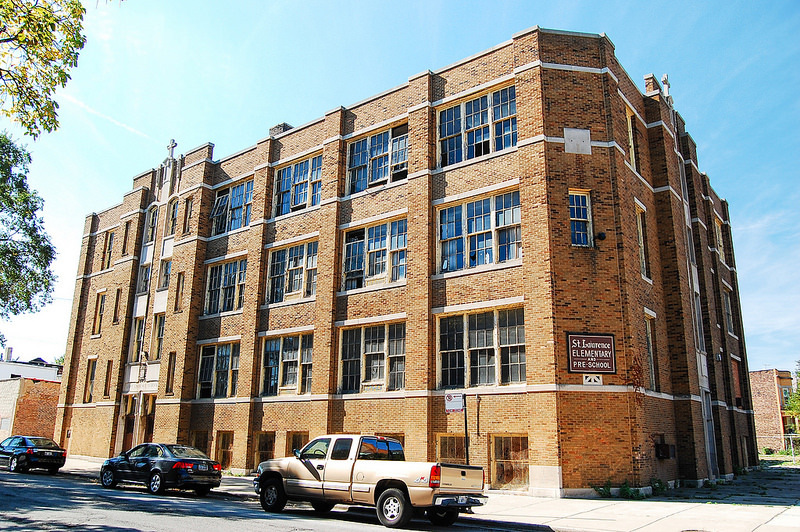 My parents owned the grocery store at 7214 S. Dorchester, directly across the alley south of the school building. Their names were Sam and Inez. Great memories, from being an alter boy, participating in the annual plays, playing on the school football team. I have a watercolor picture of the church hanging in my home. You don’t know me, but I attended St. Laurence from 1960 to 1964 then went St. Paul Lutheran at 76th and Dorchester. My family was the first of color to go to St. Laurence. I remember the store across the alley so well, but when we got there, I think there was a Mr. Maldonado working in the store. I don’t know if he was an owner, but my little brother had a big crush on his daughter Sylvia. The building always remained a store all the way through the eighties I believe. I came back in 1977 and got married at St. Laurence, have been married going on 42 years, if the church did not make it, we did! (smile) I have some very fond memories of that store, and spent every penny I had there! I graduated sls in 56,my family lived 1330 east 73 st, I remember the little store very well, pepsis and twinkies. John – my brother graduated in 56 from also and went to Mt. Carmel H.S. and graduated in 60. I’m his brother Ken and our parents, Sam and Inez, owned the store across the alley from 1953-1960 when we moved to Oak Lawn. Ken: I also graduated in 1956 from St. L and then in 1960 from Mt. Carmel. I remember Inez who was my favorite supplier of candy. I am looking for old St. L. class pictures. Mine were lost when I was in the army. Can you help? I attended St.Laurence from 1951 to 1955. I remember Sr.Hilda Marie and Fr, McKay My father built a card room in our basement and had a poker group of which Fr,McKay was a regular player. On July 22 2017 there is a get together of former students from St. Laurence, James Madison, and anyone else at the Crestwood Civic center Crestwood IL at a cost of $25.00 per person lunch included Noon to 6PM Contact below. I AM GETTING OLD IN THE HEAD! I GOT MARRIED IN 1975! NOT 1977 LIKE I SAID BEFORE. FR. KUBAS MARRIED US THERE AT ST. LAURENCE. I HAD A CHANCE TO GO BACK DURING THE DEMOLITION AND IT JUST MADE ME CRY TO SEE THAT BEAUTIFUL CHURCH AND THE RECTORY AND CONVENT DESTROYED. SO MUCH FOR PROGRESS. AT LEAST ALL OF US HAVE OUR BEAUTIFUL MEMORIES TO KEEP US AFLOAT IN THIS CRAZY WORLD OF TODAY! I was baptized at St. Laurence in May 1960 and placed for adoption later that year by my birth mother who of Irish ancestry. Please reply if this sounds familiar and if you may have knowledge of my mother. Please, serious replies only. Thank you and God bless. Kevin, have you contacted the Archdiocese of Chicago? They would have the baptismal records from St. Lawrence and you could obtain a copy. It may have names on it for you. Tried to comment last night, not sure it was delivered. Spent 9 years at St. Laurence, finally graduated in 1951. Altar boy, football,basketball, Saint Patrick’s day play. Remember Larry Marshall, Jack Eichele, Father Tracy O’Sullivan and many others. Plan on attending July reunion. Hi Janet, So good to see you among those who have enjoyed this site, and your sister Barbara. I do enjoy “reliving” my past and wish we still had those carefree times. But guess that is not to be. You do run through my mind from time to time. I still have our 50th reunion booklet. If your phone & address are still the same as back then I will be contacting you. Glad you are doing well. Also happy to see some of our other classmates also commenting. We had very good years & fond memories from those times which even though the church, rectory, convent are gone, no one can take them away. I guess school is still there. What great memories of St. Laurence! I married Dave O’Neill’s classmate, Bob Seitz, in 1956. Sixty-one years later…we’re still married! Bob and Dave graduated from SLS in 1949. I still get together with my BFFs from SLS. Have memories of going to Peipencotter’s to buy Fr. Brassil’s cigarettes. Ooops, Bob and Dave graduated in 1945! Hi everybody! Such great memories. We lived at 1406 E. 72nd St. Next to Drumms. Graduated with Barb Seitz, Judy Brown, Shirley Hoyle and Patsy Phillips and Veronica McCarthy. Dickie Rainford lived across the street and the Zollers lived behind the convent, I think. Fr. Brasil formed the Laurentians and we met in the school basement. Harold Neher, I think my brother John Hyland was in your class. Fr. Brasil married my late husband and I there in 1957 and baptized our first child there in 1958. Lots of happy memories! Good to see so many of the class of 1950 commenting. How about the classs of 1954? Class of 54 and anyone from Madison School is having a get together next Saturday 7/22 The 2017 Old Friends Get-Together is on. Time noon to 6pm. Location: Crestwood Civic Center , 14025 South Kostner Crestwood IL. If you have any menu suggestions add or remove items please contact Mike by phone or Jerry Pawlak by replying to this email. Your suggestions are welcomed. Please call Mike to make your reservation. Truly looking forward to the get together tomorrow. Will bring some memorabilia and a camera. As always the Old Friends of SLS, Madison, Paul Revere & Parkside schools was a most enjoyable gathering. Though I am not sure what, construction has begun on the cite of the razed Church, rectory and convent. The school remains standing. I am told by a former pastor that the owner/developer has plans for usage of the schools. Perhaps a condo conversion. If so, just think – you could reside just where Sr. Hilda Marie used to rule with an iron fist! THEY HAVE BUILT A SKILLED NURSING FACILITY ON THE SITE OF ST. LAURENCE CHURCH. THE CITY OF CHICAGO GIVES TIF’S TO BUILD SUCH FACILITIES IN LOW INCOME NEIGHBORHOODS. TOO BAD WHITE FLIGHT WAY BACK LED THE WAY FOR THE URBAN DECAY TODAY. I am saddened that this beautiful gothic style Catholic Church is no more. It was a landmark and memories for so many. Has our society not seen enough destruction of faith? When will we, as a community or society, stand for faith and righteousness instead of power and money? These churches in our communities speak for us and say, the Lord is here! It’s important- especially in a time of such evil and hate. Satan must have been smiling that day. Just spent the weekend with my BFFs from St. Laurence: Nancy Hyland Rios, Veronica Mc Carthy Woods, Judy Brown Bandyk, and Patsy Phillips Gorey. Many good memories of SLS! St. L 1948-1956. Then Mt.C and U.S. Army. All of my St. L school pictures were lost in a flooded basement when I was overseas. Looking for St. L Class of 1956 photos. Friend of Larry Marshall, Tom Cavenaugh, Joe O’Sullivan and many others. Football coach Frank McDermott was so dedicated to us kids. Attended South Shore High, NIU, Marine Corps, living in Flossmoor for 50 years. Loved Sisters Sheila, Jane Therese, Jane Marian and many others. Read Sr. Hilda Marie’s obit., She was 93, from Ontario, Canada and was 18 on her first assignment at St Joe’s in Homewood, IL. what a woman! Hey Jim, I’m still around but not kicking. Lost both of my several years ago and live in a retirement home out here in Simi Valley, Ca. Old friends get together now at Beggars Pizza at 15900 Cicero July 28 Noon to 5pm.Attendees are from Madison, St. Laurence, Paul Revere. The price is still the same $25.00 per person. Send Mike your check to Mike, and mark your calendar, reminder on your computer and phone. Glad to hear from you. Still remember you well, starting from kindergarten thru SLS. Also remember sisters Rosemary and Margie. I went there as did my Mother and all her brothers the last name was Brucks Ray Chuck and George we lived on 73st across from Desmonds, My parents were Married there. I was baptized there. What a great neighborhood loved it growing up. JJ Brotskys candy company . Andys Candys Grand Crossing Pool. To all graduates of ST. Laurence 1954 greetings! Many memories were made in the 8 years. Still think about Sr. Patrick Eileen and her friend, Phelan…Sister Hilda Marie sending terror in our hears if we were called down to the office. Our dance classes with Miss Green and the performance each year. We were married at St. L’s in 1960 with Fr. Brassil. /Too bad our grandkids have memories like those. Time goes by and things do change but there are some things that should have stayed the same…respect, kindness, loyalty …taught to us by the nuns. You are so right. The past several years I’ve been driving a school bus down here in Southern Illinois. Respect, is out the window. I too have a lot of great memories from my time at St. Laurence. Graduated in 1953. I did get a chance to see my 8th grade teacher, Sister Ann Charlott. I was so surprised to find out her real name was Patricia Riley.The funny thing about that is we had a girl in our class by the same name. Pat Riley. I do remember all the nuns and Father Brasil, Father McKsy. I lived at 7014 Dorchester, and used to stop at another school store at 71?? Dorchester. Wasseys. They lived in the back. All Great memories. I hope I will be able to make the reunion this year. I graduated in 54 and have many fond memories even though I was only there for two years. I hung around with Nancy Sherman, Mary Redmond and Mariyln Reynolds, Sandy Brennan.I was the third one in their twosomes. Moved to 72nd and Greenwood in the early 50’s.Attended St. Laurence 1st through 3rd grade. Loved the dance programs – Painted Doll, Old Gray Mare and Take me out to the Ballgame. Moved to Roseland in 4th grade. Best girlfriend from St.Laurence – Patty Keiner. My brother and sister attended Paul Revere Kindergarten. I still have my group communion photo from May 1953. I remember the school halls to be quite dark. I remember wearing ribbon ties, tied in bows under the color of our uniform blouses, changing colors of ribbons depending on the month. I remember mostly wearing red ribbon ties but remember wearing Green during the month of March, for St. Patrick’s Day. I think we wore light blue in May the month of Mary. I attended St. Laurence 1950 to 53. Marge, we must have been in the same First Communion class. It was Mother’s Day in 52. I had Sister Fides for first and second and Sr. Helen John for third. I moved to Oklahoma in Oct. of 53. I have so many good memories of my first yrs at school. My father and cousin graduated from St. Lawrence. I grew up on 69th Place and Harper. I remember the Painted Doll and the girl in our class who got to wear the bride dress. My dress was pink. I loved it. I also loved the gray and white stripe dress from the other show about the horse. Went to St. Laurence in 1948 and 1949. Remember the annual musical. We sang Peg of My Heart. We were the last to go on-remember coloring pictures in our classroom. Lived on the top floor of the Gaaer ‘s then my grandmother’s on Kenwood. A gasser was in my Aunt and Uncles -Bill and Mary Cahill Norris’ wedding at St Laurence. Father McKay ? Eventually was assigned to St Cajetan and became paster there. I attended St. Laurence 1942-1950. My sister Patricia and brothers Michael and John also attended at later dates. It was a wonderful time and I still miss those great days. We lived at 7354 Kenwood, not very far from the church. Margaret Donahue and I attended the last mass said before the parish closed. I attended Aquinas High School along with many of the St. Laurence graduates. It was nice to hear about fellow students and what they are doing. Did not see this website until today. Best wishes to all. I don’t know who posted the beautiful “in color” pictures of St. Laurence, but what a treasure they are! Bob and I attended St. Laurence – 6 years apart, then married in St. Laurence in 1956. My sister, Janet and her husband, and brother Bob also went there. Hello to all our old classmates! Are you related to Ann Marie Buckle? I attended St. Laurence for 1st & 2nd grades. I believe the years were 1953-55. We lived, I think, at 7336 S. Kenwood. There’s a vacant lot there now, next to an alley that went by the side of our house then curved behind it. I had 2 brothers but they weren’t old enough to go to school. I used to walk to/from school with Rose Marie who lived next door, or maybe two doors down from me, also on Kenwood (she may have been next door neighbors to you. Small World! I believe my parents and siblings lived on the upper floor where the Gassers lived then we moved a few doors down to my grandparents Ed and Mary Norris.Their address was 7320 Kenwood. If you had a sister I believe she was in my Aunt and Uncles Wedding in the 40’s. Rose Marie had a brother I believe her mother was a single parent. I think I remember the Norris. There was a daughter who lived with them and a brother. Just had a thought. Did you go to school with my brother John Murphy? I don’t remember any of my classmates other than Rose Marie. We lived in a single family home so there was no upper apartment. Rose Marie and I were practically inseparable. We walked to/from St. Laurence. We received our first Holy Communion together. One day while walking to school in the spring we walked by the neighborhood playground and decided not to go to school that day. At lunch we went to a local store close to the playground and got some candy. I think the clerk called the school on us and then a truant officer showed up and took us to school to the principal’s office. I can’t remember what the punishment was. We never did that again. I was in 1st & 2nd grades at St. Laurence. I think I was 7 going into 1st grade. So that means it was probably 1953. I was born Oct 8, 1946. For 3rd & 4th grades I went to Our Lady of Peace on 79th & S. Jeffery. Then we lived at 79th & Oglesby. I don’t remember too many of my classmates as I left in the beginning of second grade. The family next to my grandparents were the O’Learys. Many of the neighbors my Dad kept in touch with throughout the years-Hughes, O’Sullivan, Cahills, Daveran and a few more. I would stay at my grandmothers during the summers as a special treat. Central Railroad. Great people. My brother John went to school with Michael O’Leary. They are still good friends. The O’Sullivans lived on Kimbark a block behind us.Joe O’Sullivan became a Priest He is called Father Tracy and has written a book. My Mom and Mrs. O’Sullivan were good friends. We moved into the Kenwood neighborhood when I was 5 (1951). My two brothers (Jerry & Dan) were 3 and 2. We played a lot outside in the backyard. I remember it being fenced. But now there’s nothing there-no house, no fence. By the size of the trees in the back of the lot I’d say the house was probably torn down about 30 years ago. My guess but I do have a MS in forestry now. The summer before I entered 5th grade we moved again. And would you believe it we moved to a south suburb of Chicago, Dolton. We were at 147th & Kenwood. What coincidence! Rev. Tracy (Joe) O’Sullivan was the QB on our 1950 St Laurence football team. He played the same position at Mt Carmel and won the city championship under Terry Brennan who went on to coach Notre Dame. Joe was truly our classl leader. You had a sister that thought at parkside she had the shop and we all loved her. Just getting back to this website. I remember going to a St. Laurence football game. I think it was at Grand Crossing Park and it was a final. St. Laurence lost that day and everyone was so sad. Oh for the good old days. 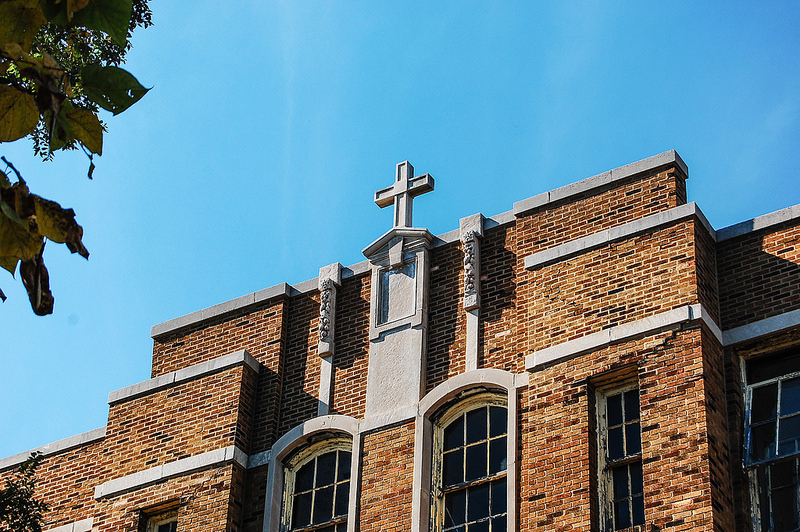 Those of us who graduated from St. Laurence during the 1950’s are truly blessed to be sharing our early years, even though many have lost spouses, other family members and friends. I just read all of the notes from so many St. Laurence alums, and the overwhelming standout was Sister Hilda Marie. A true and believable story. I as well really enjoyed the 1950 reunion, so great to see so many alums. yours truly, Nancy Hyland (Rios). Do you know if there has been any talk or planning for this year? If so, I hope you’ll post it and see how many of the class might be able to make it. Wishing you a very happy New Year! How do you want me to keep you posted???? ?